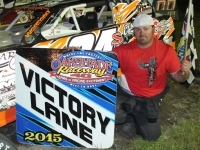 Casey Noonan continued his season of ups and downs with an up, winning Saturday night’s $2,000 to win American Late Model Series (ALMS) presented by Sunoco feature event at Oakshade Raceway. A huge crash stymied the race on the first lap with a red flag. At least eight drivers, including ALMS point leader Rusty Schlenk, were involved. After the mess was cleared, all 30 laps were run caution free. Sylvania, Ohio’s Casey Noonan started on the outside of the front row and immediately seized the lead from pole-sitter and Oakshade UMP Late Model point leader Brian Ruhlman. Noonan opened up a big lead over the rest of the field, but some slower traffic at the tail of the field hindered his progress about two-thirds of the way through the race. Two cars were racing side by side just in front of the leader and eventually, Noonan stuck his nose in the middle and made it three-wide to try to lap those cars. No one backed off and the battle continued for a couple laps. During this time, Ruhlman began to close back in on Noonan and had knocked off about half of the lead Noonan had built up. Just as Noonan finally cleared the lapped cars, the white flag waved and he went on to pick up his second feature win of the year. Ruhlman held off Chris Keller at the finish for second place which kept Noonan, who is second in Oakshade UMP Late Model points, from gaining very much in the standings. 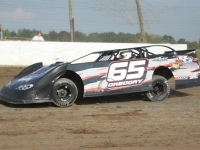 Dona Marcoullier was a close fourth place finisher with Sheffield, Illinois’ Rich Bell ending up fifth after starting 12th. 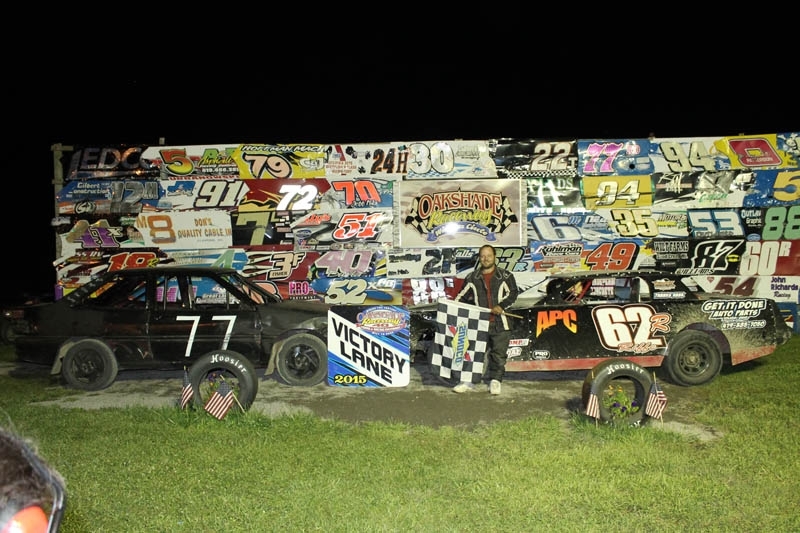 Bruce Stuart and Bob Gregory put on a great show in the UMP Sportsman feature event. 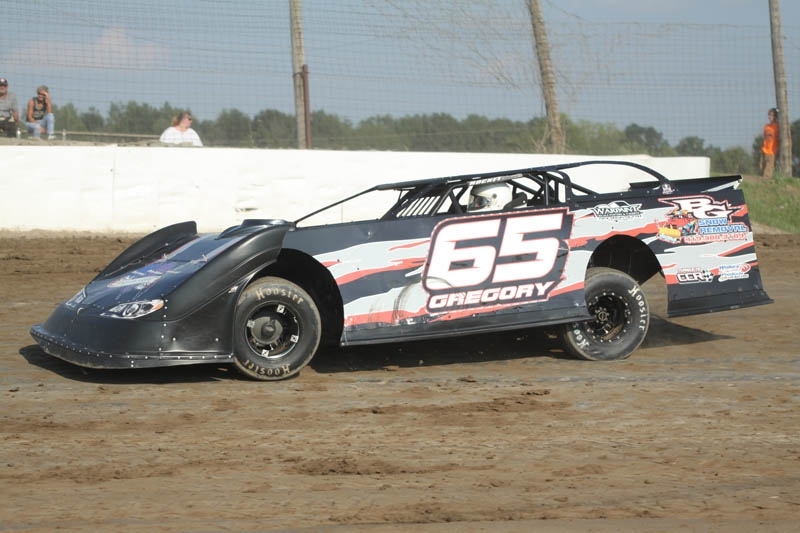 Stuart, out of Adrian, Michigan, started on the pole and had Bob Gregory pressuring him from his inside second row starting position by the completion of lap one. Gregory kept attempting to get to the inside of Stuart, but Stuart fended off the initial challenge and managed to put a little distance between him and Gregory. By lap 12 of the 20 lap race, Gregory once again reeled in Stuart and began to work on the insiden. The two drivers continued their battle through heavy lapped traffic which allowed Mathew Chapman to close in and join the battle in the final few laps. 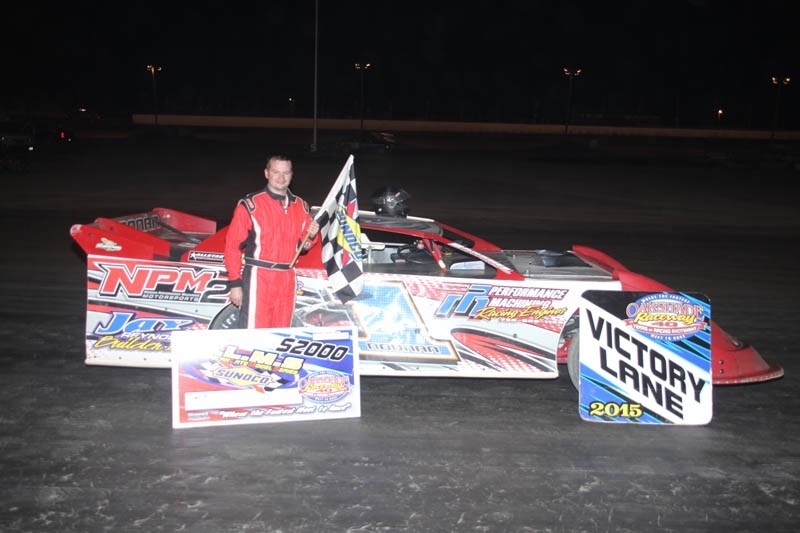 Chapman got by Gregory at the finish and made a run on Stuart, but Stuart held on to win his third feature this season and maintain a slight advantage over Jamie Grochowski atop the point standings in which only five points separates those drivers. Chapman’s late race maneuvering earned him a close second place finish at Gregory’s expense. He slipped back to third. Grochowski was fourth with George Lindsey wheeling the 49 car to a fifth place finish. 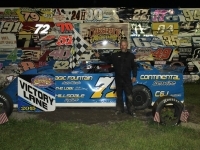 Defending Bomber track champion Jeff Foks Jr was still looking for his first Bomber A Main win this season and had a pretty good starting spot on the pole. He and Gregg DeTray battled early for the lead. DeTray finally took the lead from Foks on lap seven of the 15 lap feature. DeTray, from Swanton, Ohio, managed to maintain the lead over Foks to pick up his fifth A Main win of the year. 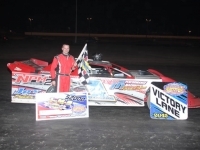 DeTray has been on a tear in recent weeks, winning the last four consecutive A Mains and has closed to within just a single point of Bomber point leader Chris Sands in the 2015 point standings. Foks settled for finishing in the runner up position followed by Tim Hancock, Chris Sands and Adam Noonan. A hard crash involving Devin Goodman, Carter Murday and Cole Walbolt in the Compact feature race brought out the yellow flag on lap two. Once back under green, Josh Floyd, John Martis and Richard Riffe battled for the lead with Toledo Ohio’s Riffe eventually winning that battle and the race. Martis was able to hold off Brogan Rehklau for third. Evan Myers ended up finishing fourth with Nathan Goodman rounding out the top five finishers. Rayce Price led the start of an exciting Bomber B Main with a lot of action just behind him. Terry Rump had worked his way up into the top five and then spun in front of a big group of cars to bring out the yellow flag. It was Toledo, Ohio’s Richard Riffe who worked his way up to the lead after starting 14th and managed to hold off Price and a hard-charging Ted Hill for the win. Price was second with Hill third. Scott Hammer finished fourth with Evan Myers close behind in fifth. 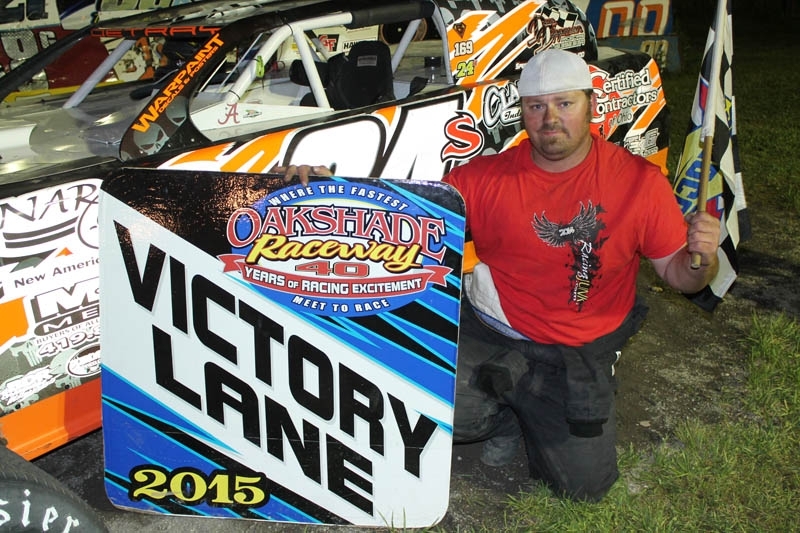 Earlier in the night, a couple of make up feature events were run from the July 18 rain out. First out was the Bomber B Main make up race which Cody Laney led early on. 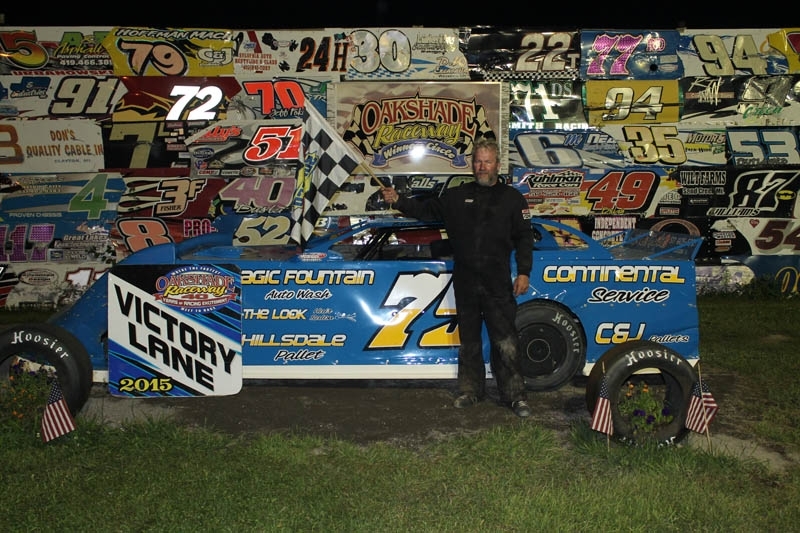 Richard Riffe, took the lead from Laney on a lap two restart and continued to lead all the way to the checkered flag which earned him two feature wins on the evening. Dylan Hough, Garry Domoe and Laney had a good battle going for second before Domoe pulled off the track on lap seven. Hough won the battle for second with Laney third. Pole-sitter Duane Fletcher took fourth with Scott Robertson ending up fifth after starting deep in the field. 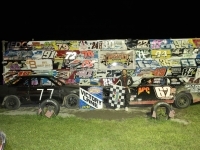 The UMP Sportsman make up feature from July 18 was also run with Joe Derbeck taking the early lead. Bob Gregory started inside row five and marched his way forward. He caught Derbeck on lap seven and took the lead away one lap later. Gregory then proceeded to pull away to take the easy win which was his second of the year. Jamie Grochowski finished second followed by Mike Jessen, Derbeck and Mathew Chapman. 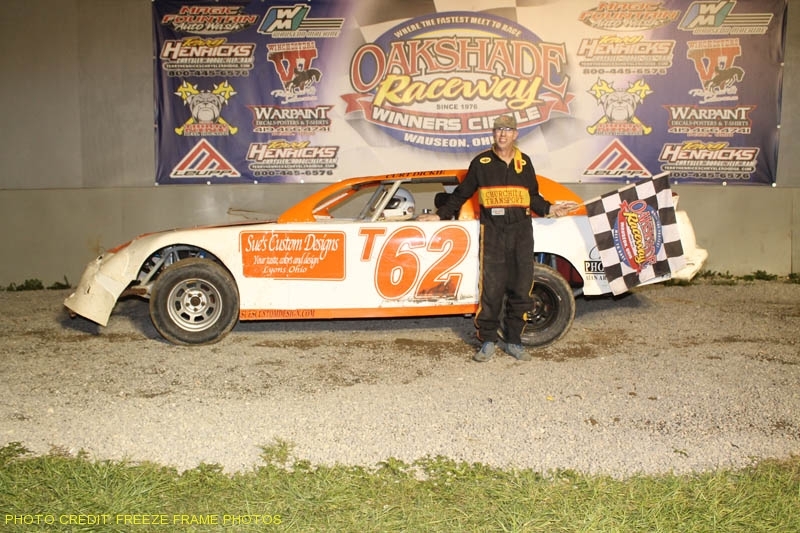 The Vintage American Race Cars will be on display and on the track at Oakshade Raceway on Saturday, August 8 in addition to a full show of UMP Late Models, UMP Sportsman, Bombers and Compacts. Gates open at 4pm with racing at 7pm. Adult general admission is just $12!